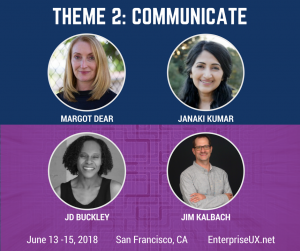 Our COMMUNICATE theme, one of Enterprise UX’s four “mini-conferences,” will help you get across the needs of our audiences, the value of our practices, and the unique skills we bring to the enterprise table. COMMUNICATE discusses how to make others understand and appreciate UX value, how to convey user insights, and how to find a common language with our non-UX partners within enterprise. If you’re struggling to effectively explain why enterprise-level UX matters to your org, you’ll find our COMMUNICATE Theme at Enterprise UX 2018 particularly relevant. Get a taste of what we’ll cover in this short podcast interview with Margot Dear—or just go ahead and register for Enterprise UX.